CELEST Coaching guides you to discover and leverage the tiniest alterations – in your perception and behaviors – that will generate the most positive results in your life. How many people do you know can who state a personal goal or intention, and then stay with it and see it to fruition, all (or most of) the time? In my observation, follow-through for personal, positive transformations can be really difficult for many people. But why is that? It’s an old, worn-out, broken-record in a person’s head. It’s often in the background. And it usually sounds like: a regret about the past, a worry about the future, or a vague feeling that won’t go away. These thoughts and feelings seem to have a life of their own. Like subliminal background music gone awry, they steer us away from the very things and experiences we desire most. Mental and emotional techniques, as well as bodywork, usually offer temporary solutions – at best. Why? Because deep-seated, unwanted thoughts and feelings are stored in our MINDBODIES. They are EMBODIED. Therefore, they need to be addressed and released at a MINDBODY level. Once they are accessed and released, we are free to live from our true radiance, our true joy, from the spaciousness of LOVE that we ARE. This is what it means to live from our Core Essence. 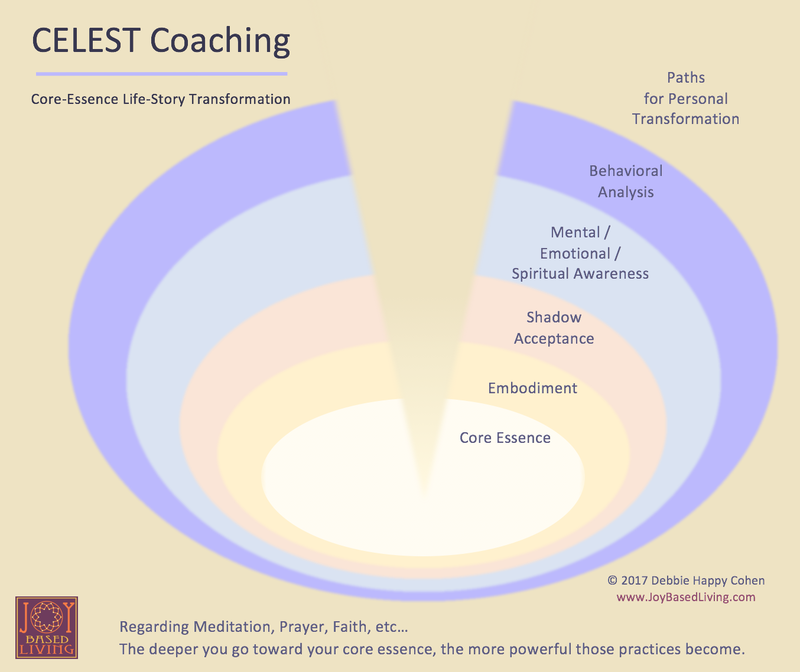 In this essay, I’ll briefly describe various paths for personal transformation as I have experienced them so that you can get an understanding of CELEST: Core-Essence Life-Story Transformation, and you can get an idea of how it can work for you. After getting a bachelor’s degree in psychology, my very first “real job” in the world was getting paid $50 an hour by the State of Florida to provide behavioral consultations for people with “intellectual disabilities” (I just looked up the politically correct terminology) and those who cared for them. A psychologist named BF Skinner ruled the house in this arena of stimulus response (such as the dogs who would salivate in response to a ringing bell), and I was taught to observe people’s environmental triggers, and influence their behavioral changes by applying consequences such as as positive and negative reinforcement, etc. Although it worked some of the time, something felt strangely inhumane about the whole thing. Detached. Disconnected. This was a very confusing period for me – because while I was attempting to impact the tiniest shifts in behaviors (such as eating properly, dressing properly, using the loo properly, and not hitting the teacher), I was also questioning religion and was intensely immersed in studying motivational and spiritual ideas. Motivational books such as Napoleon Hill’s Think and Grow Rich, and Stephen Covey’s 7 Habits of Highly Effective People influenced my thoughts and behaviors along with psycho-spiritual ideas from A Course in Miracles and Louise Hay’s groundbreaking book You Can Heal Your Life. With the guidance of my spiritual teacher, Carolene Heart, who taught the power of love and who mentored me for 25 years, I practiced past-life regression and became a Reiki Master. I learned about crystals and how to perform spirit releasement. These practices gifted me with a community – a “subculture of wellness” which shaped my future. I learned that #1) there are people in the world who, like me, are questioning everything, searching for answers. And #2) I saw that the light within us – which I experienced “in-between lives” – is who we really are. I entered graduate studies in counseling with an attempt to figure out how to raise children. BF Skinner and A Course in Miracles (ACIM) were two opposite extremes and neither made sense to me in terms of how to apply them effectively for long-term well-being: Where Skinner ignores feelings, which can result in a well-behaved child who feels alienated from you and is silently seething (extremely authoritarian) . . . ACIM mostly offers perception shifts from fear to love, rather than behavioral shifts. When applied without clear understanding, you can end up with anarchy, creating children who become demanding little monsters. NO, this is NOT what ACIM is suggesting. HOWEVER, until you really learn the depth of The Course, which can take years… how the heck do you make SMART CHOICES in the meanwhile? Psychology was born of studying illness, not wellness, and I could never feel content about that. I had read Bernie Siegel’s groundbreaking book Love, Medicine and Miracles, and I believed in the power of statistics and how we ought to be using them to inform ourselves of why people recover – or why they sustain health – rather than why they get sick. By the time I graduated with a degree in counseling, I had learned too much about people’s brilliance and beauty to want to spend my life inside of problem-centered conversations. I wanted to work with people in the context that they’re aiming to bring out their best – and that problems are simply blips – or opportunities – in their process of emerging. My greatest thrill was laser-focusing on people’s gifts and strengths, and empowering them with the greatest force in the world: LOVE. A few months after graduating, I met a most amazing life and business coach, Alfonso Castaneira, who taught me the ropes. I am deeply and forever thankful to him and to Carolene Heart for lighting my way. The work of Carl Jung and Clarissa Pinkola Estés (author of Women Who Run With the Wolves), as well as Debbie Ford’s book The Dark Side of the Light Chasers brought home the importance of facing – our shadows. Our shadows include anything we want to avoid admitting that we think or feel or desire because, on some level, we think they are taboo, unacceptable by our culture. Shadows can include grim things like wanting to harm oneself or others. And they can include great things such as our highest callings. Not running from them, denying them, distracting ourselves from them, or sugarcoating them with spiritual soliloquies like affirmations and positive thinking. If this isn’t addressed, you will be at odds with yourself, your will will be conflicted, and your power will be diluted. The 12-step programs really help address the Shadow, and in fact, Carl Jung played a part in the development of some of the practices, including naming your shadows and making amends. In many Personal Development Groups, I noticed that the shadow was discussed. However, it was usually a mental activity – or an emotional release – rather than embodied awareness. An unnamed, undiscussed “flogging” of self and others would voice itself (I’ll share more about this in a minute). I witnessed mental gyrations without a lot of lasting transformation. And I experienced groups where, when you were there, it was really empowering, but when you left, you felt dependent on the teacher(s) for continued support. These groups opened many doors for me, but also left me with many questions. In many 12-Step Programs (where peer support is a central strength), many people stop their disabling behavior (such as alcohol abuse or codependency). But the steps don’t guide them much further than that. To claim one’s birthright – to boldly acknowledge and honor the idea that we are brilliant and beautiful beyond measure – seems to be taboo in most circles. “Humility” is the catch phrase for keeping the ego in check. Which works just fine for newcomers to 12-step programs. But I don’t see this being helpful for people who are long-term members. But First: Without a commitment to oneself FIRST AND FOREMOST… Without placing FIRST ATTENTION ON SELF… all of the above attempts at transformation will not really stick. At best, your power will be diluted. At worst, they’ll backfire. Example: You’ll gain spiritual power and manifest cool stuff, but you’ll sabotage the results. You’ll hit joy-ceilings and abundance-ceilings over and over again until you can EMBODY AND BREATHE through them. What does First Attention On Self look like? It looks like FEELING what your body is telling you at any given moment. Examples: Turn left. Do the dishes. Write this essay. Go on a walk. Call your mother. YOUR BODY KNOWS what you need, at any given moment, in order to feel most comfortable, balanced and at ease. In order to thrive! Unless you are clear about who you are and what’s most important to you, your mind – and your conflicting desires and your cultural admonitions – will get in the way, distract you, dilute your efforts, weaken your power. The embodiment of 3 archetypal wounds and healing fields: What’s necessary here is to recognize – on an EMBODIED LEVEL – how we wound ourselves and others, and how we can apply antidotes to those wounds and heal them forever. The 3 Wounds are shame, abandonment, and betrayal. Shame feels hot and humiliating, Abandonment feels cold, Betrayal feels hot and angry. The 3 Healing Fields (antidotes to the wounds) are honor, commitment, and loyalty. Honor heals shame, Commitment heals abandonment, Loyalty heals betrayal. In order for the wounds to be released and for the healing fields to take their rightful place in your life, embodiment is essential. EMBODIMENT takes PRACTICE and may require personal coaching in the beginning because, as a culture, we have learned to TURN OFF our ability to hear our bodies’ intelligence, and we have forgotten how clearly our spirit speaks to us THROUGH OUR BODIES. In our world, most of us “listen” under extreme circumstances. Example: You walk into someone’s house and in one of the rooms you get the creeps. You leave. You later find out that something devastating happened there. Example: You receive an opportunity and your entire body lights up with goosebumps. In our world, most of us “listen” under extreme circumstances. Example: You walk into someone’s house and in one of the rooms you get the creeps. You leave. You later find out that something devastating happened there. Example: You receive an opportunity and your entire body lights up with goosebumps. The true power of love blossoms through us, when we listen to its guidance into our everyday lives. Thanks to Dr. Mario Martinez, for his groundbreaking work on archetypal wounds, healing fields and embodiment: how culture heals and wounds the immune system. This work filled in the missing pieces for my work in personal transformation and is the main influence for the Joy-Based Living Beginner’s Guide. You are made of love, pure joy, absolute radiance. You ARE awareness itself. You ARE this moment. When you realize this, you have a superpower: with pure amazement and love, you turn toward every thought and feeling you have. Without judgment. Without resistance. Old baggage simply disappears. Or it evolves, to serve your highest calling. Your energy is now set free to support your highest calling and your best work. BIG WOW! And bonus: You thrive! It’s your Core Essence which we engage in CELEST Coaching. By identifying with the deepest, grandest and truest aspect of ourselves, we become more aligned, more empowered, less conflicted, more clear, and more intuitive about the next powerful step to take in our lives. IN THIS VERY MOMENT. CELEST Coaching guides you to discover and leverage the tiniest perception shifts and behaviors that will generate the biggest impact in your life, giving you the ability to experience greater connection, creation, contribution -and JOY – every single day of your life! !